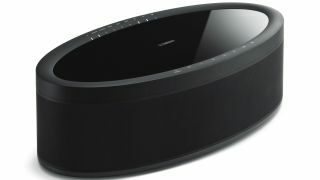 Yamaha adding AirPlay 2 to 15 home audio products | What Hi-Fi? Fifteen of Yamaha's home audio products are about to get Apple's AirPlay 2 wireless tech. These include the MusicCast 50 smart speaker and MusicCast Bar 400 Soundbar. AirPlay 2 will hit the devices later this month. Yamaha is also adding expanded Spotify Connect capabilities as well as support for the Qobuz hi-res music streaming service. What's more, compatible devices will gain Actions on Google, meaning they can be controlled using the voice-activated Google Assistant smart assistant. With AirPlay 2, you can stream Apple Music and other music services from your iPhone, iPad, HomePod or Mac computer to your Yamaha speakers. It also lets you control your Yamaha speakers with just your voice using Siri on your Apple device. The devices getting AirPlay 2 are: MusicCast 50 and MusicCast 20 smart speakers, MusicCast Bar 400 soundbar, Yamaha's RX-A 80 series AV receivers, RX-V 85 series AV receivers, RX-S602 AV receiver, ATS-4080 soundbar, TSR-7850 AV receiver, CX-A5200 AV preamp, XDA-QS5400 MusicCast multi-room streaming amplifier and the MusicCast Vinyl 500 turntable. The update will arrive in late April - keep a lookout for your device. When it's available, you'll be prompted to update via the MusicCast app.